The goal of Pyramid is to discard the entire deck by finding pairs of cards that add up to 13, regardless of suit. Kings count as 13 and are discarded singly, Queens as 12, Jacks as 11, etc. The board consists of a Stock, located in the upper left corner, a Pyramid, located in the center and a Discard Pile located in the upper right corner. The Pyramid consists of 28 cards, dealt face up and arranged in seven rows. 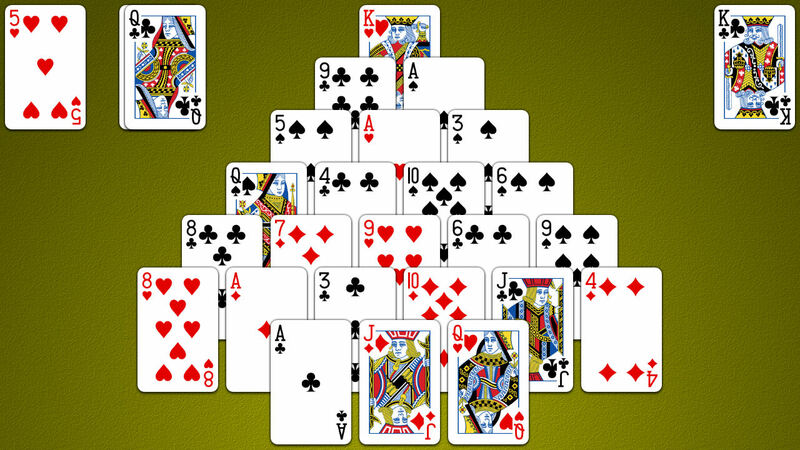 The top row contains one card, the second two and the last seven.At the beginning of the game every card in the Pyramid (except for the ones in the bottom row) is partially covered by two cards on the row below. Only cards that are completely uncovered are available for play. The cards in the Stock can be cycled three times, one at a time. The cards at the top are available for play. A pair of available cards that add up to 13 can be discarded to the Discard Pile. Giza and Seven are variations of Pyramid with slightly different board layouts.